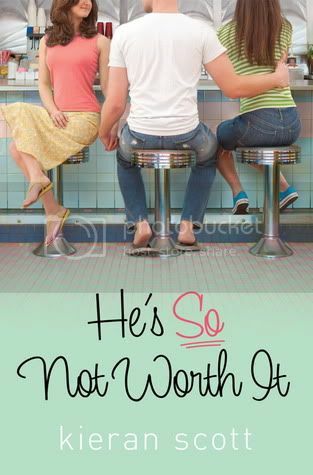 I was thrilled to be able to start reading ‘He’s So Not Worth It’, right after reading ‘She’s So Dead to Us’. I really liked reading the first book, and was ready to get back into the story to see where the Ms. Scott would take us next. I really loved Ally in She’s So Dead to Us. To me, she seems like a completely different person in ‘He’s So Not Worth It’. Which is definitely understandable, considering what all she has been through, and what the future holds for her. I felt really bad for her, she was just an emotional mess. This causes her to make some pretty bad decisions, and also makes her totally act like a teen. (ha!) She turned into a mean, rude, whiny little girl that we didn’t see in the previous book. And yet, I still loved her! I really missed Ally and Jake being together in this one. That's part of what I loved most in the first book. I still have a love/hate relationship with all of the other characters, Jake especially. The boy cannot make up his mind about anything, he’s SUCH a guy. But yet, (AGAIN), I love him! We see different sides of the secondary characters; Shannon, Faith, Chloe, Hammond, etc… And I have to say, for the most part, I enjoyed them more in this book than I did in the first book. I can’t stand the dad. Where does he get off?? The one character that I have loved from the beginning is Annie. Not only for the comic relief, which was great, but she’s just a really amazing friend. She’s definitely one of my favorites in this book. The characters are so well written, it's hard not to care for all of them. Much like the first book, the writing on this was really creative, and the plot drew me in once again. I absolutely love Ms. Scotts writing style. It’s the drama… it pulls me in, keeps my attention and leaves me wanting more. (That’s how great books are written!) I sped through this book in no time; I just had to know what was going to happen. The ending has a pretty big cliff-hanger, and I will definitely be checking out the next book, because I NEED to know what happens! Overall, this was a really good read for me! Check out my review for She's So Dead to Us! OMGOMG LET'S FAN GIRL OVER THIS SERIES!! I loved Ally in this one as well! Her behaviour was all over the place but with the crap she's been going through, I can't even blame her! And Jake! Swoon :) Like you, I would've loved to see them together more. Gosh, I can't get enough of these books! THIS IS SO NOT HAPPENING, come to me!! I LOVED She's So Dead to Us! I'm really glad you liked this, and I agree about Jake - he was like that a lot on the first book too! I loved it :P. I can't wait to get started, thanks so much for the great review! Ah, the classic characters we love and hate! I haven't read this series, but I wonder what my reaction would be to find a character so different from the first book. I think I'd struggle with that. THis sounds so good. I am tempted to check out the first one now. I love characters that are flawed but you still manage to love them. It shows great writing. Great review!